The academic year 2015-2016, inauguration on 12.08.16 in St. Peter’s institution campus. Dr. S. Ravichandran, Vice-chancellor, Preside over the inaugural function. He said it was every one responsibility for our nation to create good health and wealth, Dr. L. Mahesh Kumar, Director-Academic, facilitated the function. Dr. K.Balagurunathan, Advisor, appreciated the objectives of the Special camp of SPIHER, NSS Unit and briefed on the need for such a programme and wished all success for the programme. Dr. P. Peyiyasamy, Programme Officer, enlightened the volunteers about “NSS camp guidelines”. The function came to a conclusion with the recital of National Anthem. “Clean India Campaign” and tree plantation was organized under National Service Scheme (NSS) Unit on January 11.09.2015 at the institution Campus. The Clean India Campaign was initiated by Dr. S. Ravichandran, Vice Chancellor, SPIHER. Further 20 sapling plantation were planted in our institution Campus. Mr. Krishnamoorthy, Counsellor, Konambedu School. Dr. D.S. Ravichandran, Vice-chancellor, Preside over the inaugural function. He said it was based on the “Healthy Youth for Healthy India”, Dr. K. Balagurunathan, Advisor, facilitated the function. Mr. Krishnamurthy, Councellor, was the chief guest, appreciated the objectives of the Special Camp of SPIHER, NSS Unit and briefed on the need for such a programme and wished all success for the programme. Dr. P. Peyiyasamy, Programme Officer, enlightened the volunteers about “NSS camp guidelines”. After the inaugural function, 50 volunteers along with 2 staff visited the konambedu village. “Survey camp” was initiated by Mr. Krishna Murthy, 15th ward counsellor, L. Mukesh ward member of the village. Volunteers went door to door and took down the names of the families members to identify the problems. The statistical details of the survey are submitted to the ward counselor. The third day of NSS camp started with the “Clean India Campaign and Tree plantation” was inaugurated by Dr. L. Mahesh Kumar, Director-Academic. In the morning session the volunteers proceeded to clean in and around the school campus premises. Different groups were assigned to different places around the temple to involve enthusiastically in the cleanness work. In the afternoon session the volunteers proceeded to sapling plantation near the temple premises. Firstly the reserved area for plantation had been cleared and dug well by the volunteers. Then the volunteers planted 25 saplings in the village. The whole day was full of activities and main objective was to inculcate the spirit of selfless service and voluntary work among the volunteers. The fourth day of NSS camp begins with the “Eye camp”. Volunteers, school students and village people are participated the eye camp. All are benefited from this eye camp. In the afternoon session started with the inauguration of “Electrical Wiring and power savings” inaugurated by Mr. Senthil Velan, EEE Dept., SPIHER. The school students actively participated this session. It was a great experience for all the students. 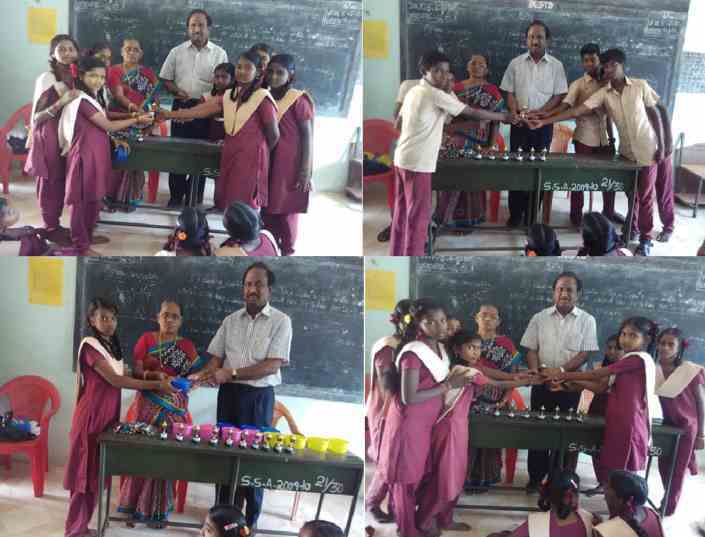 Mr. Rajendran was given an on “Book Bindings” for volunteers and students. The practical class are very useful for and self-confidence and offered various techniques to the volunteers to enable them to manage a financial adjustments in daily life. And also motivated the volunteers and students to serve the community in a best possible manner. He shared many points to enhance self-confidence. He made the session interactive. 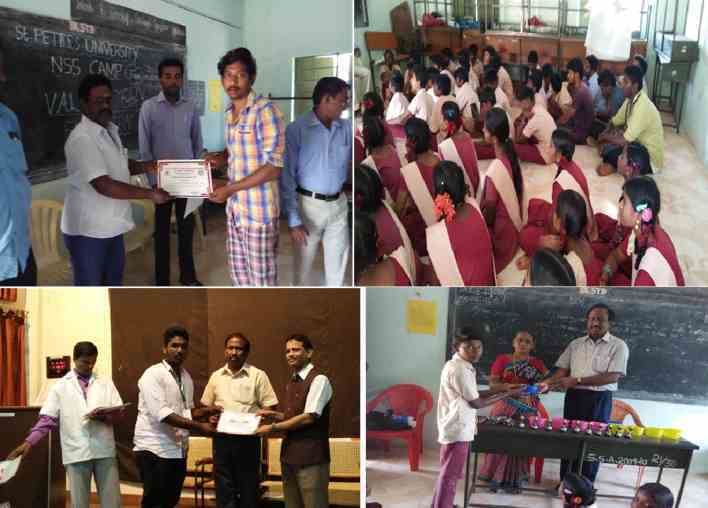 “Valedictory function” was organized on the last day in the school campus, Dr. S. Ravichandran, Vice-chancellor, SPIHER, Dr.L.Mahesh Kumar, Director Academic, SPIHER, Sri D. Nachathiram, Head Mistress and Mr. N. Rajaram ward counselor of konambedu village were the dignitaries of the valedictory function. Certificates were distributed to all the Volunteers and Prizes were distributed the winners of the competitions, followed by it feedback from volunteers and students were discussed. The academic year 2014-2015, inauguration on 28.10.14 in St. Peter’s institution campus. Dr. D. S. Ramachnadra Moorthy, Vice-chancellor, Preside over the inaugural function. He said it was a each & every one responsibility for our nation to create good health and wealth, Dr. L. Mahesh Kumar, Director-Academic, facilitated the function. Dr. K.Purushothaman, HOD, Mech appreciated the objectives of the Special camp of SPIHER, NSS Unit and briefed on the need for such a programme and wished all success for the programme. Dr. P. Peyiyasamy, Programme Officer, enlightened the volunteers about “NSS camp guidelines”. The function came to a conclusion with the recital of National Anthem. Unity, Safety and Security the 139th Birth Anniversary of Sardar Vallabhbhai Patel Ji was celebrated in a grand manner in St. Peter‟s Institute of Higher Educations and Research on 31.10.2014. The programme was presided over by Dr. D.S. Ramachandra Murthy, Vice Chancellor, SPIHER. Further the program was inaugurated by Dr.K. Balagurunathan, Advisor, SPIHER and Former Vice Chancellor and delivered the speech. Initially Dr. S. Shanmugham, welcomed the gathering and gave a brief talk on the importance of National Unity highlighting the role of Sardar Vallabhbhai Patel in bringing together all the princely states in to the folds of our country. Vice Chancellor Dr. D.S. Ramachandra Murthy stressed the need for Unity in Diversity and the role of our great national leader in building India in to a Strong and Cohesive force. Dr.K. Balagurunathan, Advisor, SPIHER and Former Vice Chancellor delivered the speech. He recalled Sardar Vallabhbhai Patel vision and Acton in the spirit of unification of our country. He said that Patel was the truly Architect of Modern India and as Iron Man of India at that time. He further emphasized that Patels life was the journey of service to the mother land and for the unity of the nation. He pointed out that Patel with Mahatma Gandhi formed an unbreakable pair. He stressed that the nation to remember the former Deputy Prime Minister and Cherish his vision action towards India after Independence. He further said our culture and legacy is of unity in diversity and emphasized that all the indians should rise over differences of Cast, Creed, Community and Language so as to strengthen the Indian Nation. Dr. K. Balagurunathan, Advisor, administered the “Rashtriya Ekta Diwas Pledge” to all the students, faculty and staff. The entire program was conducted under NSS Banner. Dr. P. Periyasamy, NSS program coordinator gave the vote of thanks. The function came to a conclusion with the recital of National Anthem. “Clean India Campaign” and tree plantation was organized under National Service Scheme (NSS) Unit on 09.01.15 at the institution Campus. 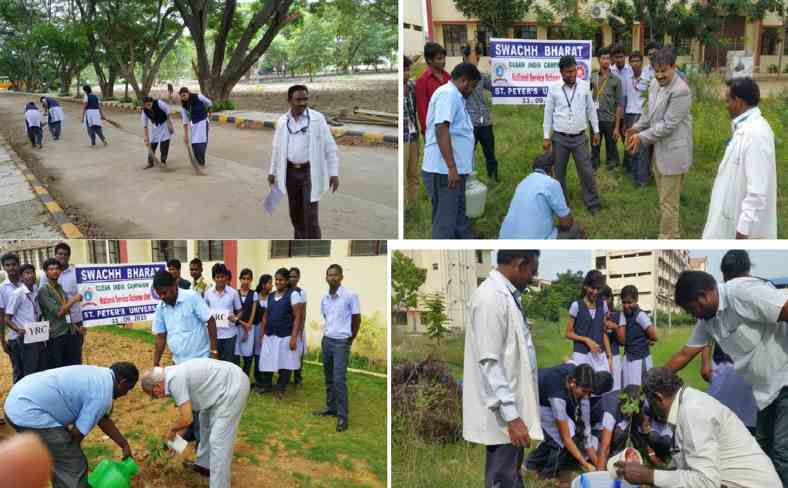 The Clean India Campaign was initiated by Dr. D. S. Ramachandra Moorthy, Vice Chancellor, SPIHER. Further 25 sapling plantation were planted in our institution Campus. Dr. D.S. Ramachandra Moorthy, Vice-chancellor, Preside over the inaugural function. 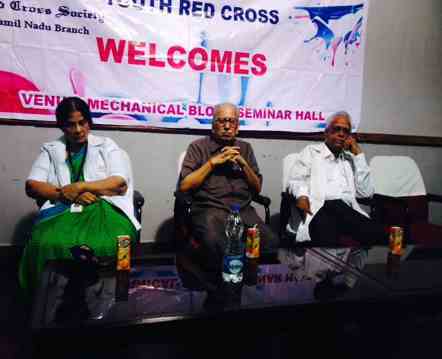 He said it was based on the “Healthy Youth for Healthy India”, Dr. K. Balagurunathan, Advisor, facilitated the function. Mr. Krishnamurthy, Councellor, was the chief guest, appreciated the objectives of the Special Camp of SPIHER, NSS Unit and briefed on the need for such a programme and wished all success for the programme. Dr.P. Peyiyasamy, Programme Officer, enlightened the volunteers about “NSS camp guidelines”. After the inaugural function, 50 volunteers along with 2 staff visited the konambedu village. “Survey camp” was initiated by Mr. Krishna Murthy, 10th ward counsellor, L. Mukesh ward member of the village. Volunteers went door to door and took down the names of the families members to identify the problems. The statistical details of the survey are submitted to the ward counselor. The third day of morning session the NSS camp started with the “Disaster Management” was inaugurated by Dr. P. Periyasamy, NSS Programme Officer, SPIHER. In the afternoon session the volunteers proceeded to clean in and around the school campus premises. 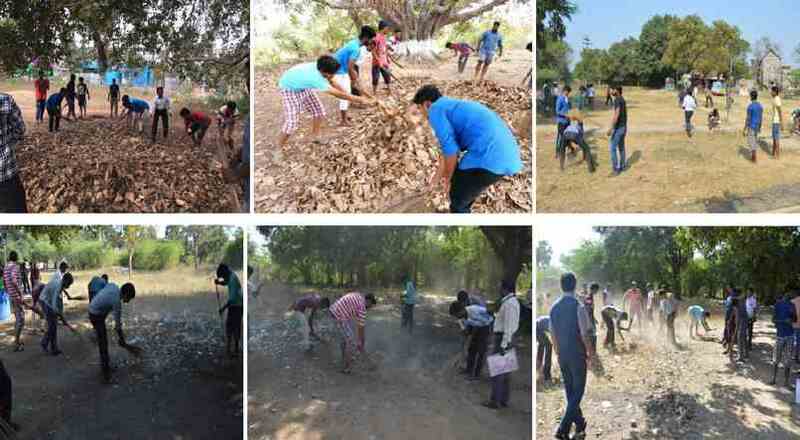 Different groups were assigned to different places around the temple to involve enthusiastically in the cleanness work. Dr. S. Gunasekaran delivered a lecture on “Self-Motivation for next generation” for volunteers and students. The lecture highlighted the self-confidence and offered various techniques to the volunteers to enable them to manage stress in daily life. And also motivated the volunteers and students to serve the community in a best possible manner. He shared many points to enhance self-confidence. He made the session interactive. In the afternoon session started with the inauguration of “Sports for School Students” inaugurated by Mr.Palanivel Rajan/Physical Director and volunteers organized the “Sports events”. The school students actively participated in the games like kho-kho, volley ball, kabadi etc. It was a great experience for all the volunteers. The sixth day of NSS camp began with the “Health Awareness” was inaugurated by Dr. K. Kantharaj/HOD -BME. All the volunteers and school students participated and expressed that the programme was very useful to maintain good health. The sixth day of afternoon “Women’s Activities” was inaugurated by Dr. R. Gayathri HOD-MBA, SPIHER. All the volunteers and school students participated and expressed that the programme was very useful for present day education system. The sixth day of NSS camp began with the “Plumbing work” was inaugurated by Mr. Sri Ram, Instructor/ Mech. All the volunteers and school students participated and expressed that the programme was very useful to maintain good health. “Valedictory function” was organized on the last day in the school campus, Dr. D. S. Ramachandra Moorthy, Vice-chancellor, SPIHER, Sri D. Nachathiram, Head Mistress and Mr. N. Rajaram ward counselor of konambedu village were the dignitaries of the valedictory function. Certificates were distributed to all the Volunteers and Prizes were distributed the winners of the competitions, followed by it feedback from volunteers and students were discussed. Both the guest and other dignitaries appreciated the activities done and congratulated the team for a successful completion of the NSS camp. Programme officer gave vote of thanks. The academic year 2016-2017, inauguration on 21.10.16 in St. Peter’s institution campus. Dr. S. Ravichandran, Vice-chancellor, Preside over the inaugural function. He said it was a each & every one responsibility for our nation to create good health and wealth, Dr. L. Mahesh Kumar, Director-Academic, facilitated the function. Dr. K.Balagurunathan, Advisor, appreciated the objectives of the Special camp of SPIHER, NSS Unit and briefed on the need for such a programme and wished all success for the programme. Dr. P. Peyiyasamy, Programme Officer, enlightened the volunteers about “NSS camp guidelines”. The function came to a conclusion with the recital of National Anthem. “Clean India Campaign” and tree plantation was organized under National Service Scheme (NSS) Unit on January 15.11.2016 at the institution Campus. The Clean India Campaign was initiated by Dr. S. Ravichandran, Vice Chancellor, SPIHER. Further 20 sapling plantation were planted in our institution Campus. Mr. Krishnamurthy, Councellor, was the chief guest, appreciated the objectives of the Special Camp of SPIHER, NSS Unit and briefed on the need for such a programme and wished all success for the programme. Dr. P. Peyiyasamy, Programme Officer, enlightened the volunteers about “NSS camp guidelines”. 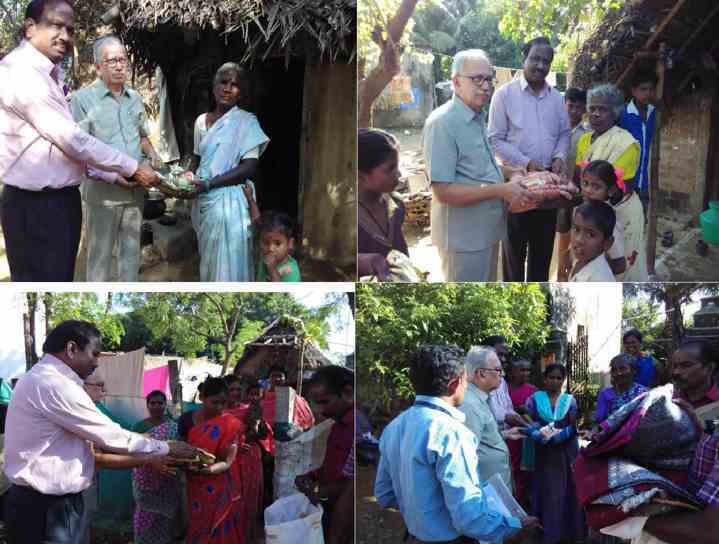 After the inaugural function, 50 volunteers along with 2 staff visited the konambedu village. The third day of NSS camp started with the “Clean India Campaign and Tree plantation” was inaugurated by Dr. L. Mahesh Kumar, Director-Academic, SPIHER. In the morning session the volunteers proceeded to clean in and around the school campus premises. Different groups were assigned to different places around the temple to involve enthusiastically in the cleanness work. In the afternoon session the volunteers proceeded to sapling plantation near the temple premises. The fourth day of NSS camp begins with the “Yoga class”. Volunteers and school students participated actively in the yoga classes; the session was about concentration and importance of yoga for our health. All the students‟ volunteers are benefited from this yoga classes. In the afternoon session started with the inauguration of “Sports for School Students” inaugurated by Mr.Palanivel Rajan/Physical Director and volunteers organized the “Sports events”. The school students actively participated in the games like kho-kho, volley ball, kabadi etc. It was a great experience for all the volunteers. The afternoon session started with “Digital payments systems”, was organized for school students to enhance their economic status. This was dealt by Dr. R. Latha/COE, SPIHER. Students were taught how to pay Digital payments systems through PAYTM. Students expressed that the programme was very useful. The sixth day of NSS camp began with the “Youth and Society” was inaugurated by Mr. Hari Raj AHM/konambedu School. All the volunteers and school students participated and expressed that the programme was very useful to maintain good health. The sixth day of afternoon “Moral Education” was inaugurated by Dr. R. Gayathri/HOD-MBA, SPIHER. All the volunteers and school students participated and expressed that the programme was very useful for present day education system. Youth Red Cross of SPIHER organized an awareness program on “The benefits of Trees” in the college premises on April 7th 2017. YRC members of the college along with NSS students planted saplings in the campus and also created awareness among all the Teaching, Non-teaching and fellow Students. Dr. Francis C. Peter, Vice-Chancellor, Preside over the inaugural function. He said it was a each & every one responsibility for our nation to create good health and wealth, Dr. L. Mahesh Kumar, Director-Academic, facilitated the function. Dr. D.S.Ramachandra Moorthy, Director R & R, appreciated the objectives of the Special camp of SPIHER, NSS Unit and briefed on the need for such a programme and wished all success for the programme. Dr. P. Peyiyasamy, Programme Officer, enlightened the volunteers about “NSS camp guidelines”. The function came to a conclusion with the recital of National Anthem. To create awareness among the people about the need of organ donation. To distribute the messages of organ donation all over the country. To remove the hesitations of the people about donating organs. To say a grateful thanks to the donors of organs. To motivate and encourage more people towards organ donation in their life. 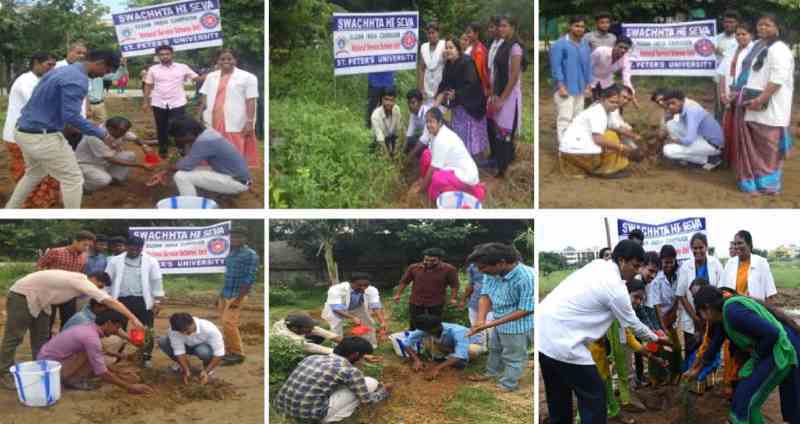 “Clean India Campaign” and “Tee Plantation” was organized under National Service Scheme (NSS) Unit on 22.09.2017 at the institution Campus. The Clean India Campaign was initiated by Dr. D.S. Ramachandra Moorthy, Director R & D. Further 70 sapling plantation was planted in our institution Campus.